For some reason that I've never really been able to fathom, parsnips seem to be the most consistently unappreciated vegetable. Seen as the pallid ugly step-sister of the 'popular kid' carrot, the parsnip is the kind of veggie that in high school, would have been found hiding in the corner, playing solitaire, off on its own. I would be willing to wager that probably half of people don't even really know what a parsnip is, or what you should do with it. We had to go to two grocery stores to even buy them (seriously, as if one of the biggest grocery stores in the city didn't have either silken tofu or parsnips. Appealing to the masses, I guess). Perhaps because I've also been known to play a solitaire game or two, or because I've always had a soft spot for this albino carrot cousin. Actually, did you know that both carrots and parsnips are members of the parsley family? Celery is too. I never would have thought it, but then again, I don't really look anything like half my family members, so this really shouldn't come as a surprise. I probably had boiled parsnips before I had them any other way when I was a kid, and I even liked them back then. 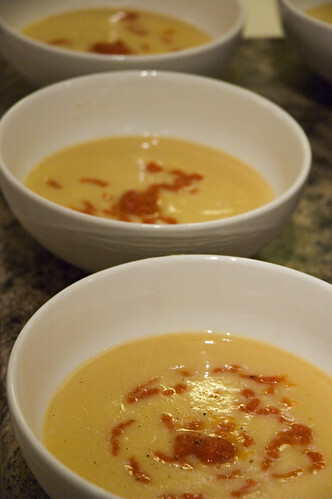 Back to the parsnippity soup. So I decided I wanted to have a parsnip soup. But I wanted something with body, with character and a little bit of quirkiness. I didn't want it to taste like parsnip purée....I really wanted to go to another level of this vegetable. So rather than sautéeing them, I decided to roast 'em. 2. 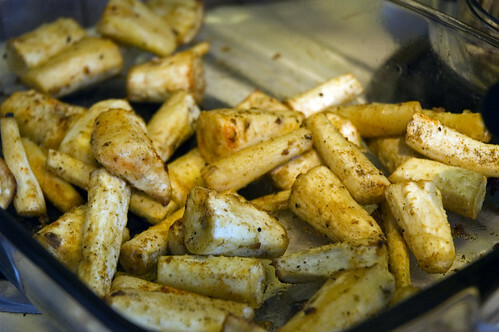 Cut the parsnips into even sized chunks (mine were mostly about 2 inches long and 1 inch wide, give or take). 3. In a large bowl, mix the olive oil with the garlic, salt and pepper. Toss the parsnip pieces in this mixture (or you can be lazy like me and just dump it all together in the pan and mix it that way). 4. Spread out the parsnips in an oiled 9x13 glass pan. Sprinkle with the cumin, cardamom and smoked paprika. 1. In a large pot (at least 3 quarts), heat the olive oil over medium heat. Add onion and celery and sauté until they are softened (about 5 minutes). Meanwhile, chop up the roasted parsnips into smaller cubes. 2. Add roasted parsnips and sauté another 2-3 minutes. At this point, add in the smoked paprika, cumin and cardamom. Sauté 1-2 more minutes. 3. Add water and bring to a boil. Allow to simmer for about 30-35 minutes, until celery is very soft. Taste the broth at this point and add some salt (despite not being puree yet, the soup should still be quite flavourful). 4. Remove from heat, and purée *I highly recommend getting and immersion blender. Makes your life easier, and less mess (and with my dishwashing track record, this is a good thing). If needed, add more water until you get to your desired consistency (I probably added another cup of water to get the soup a bit thinner than it was). Taste again, and add more seasoning if desired (salt, pepper, or one of the spices). 5. Serve hot, topped with roasted red pepper coulis (take 1-2 roasted red peppers, peeled and puree in a blender/food processor - if you can't have cream/sour cream, this is a colourful, healthy and tasty vegan alternative). Yum.